In the 17th century, missionaries, primarily Franciscans, started to come to the Copts. In 1630, a Cairo mission of the Capuchin Order was founded. The Jesuits came in 1675. In 1713, the Coptic Patriarch of Alexandria again submitted to Rome but, as in 1442, the union was not of long duration. He has seven suffragan bishops, throughout Egypt, comprising the only Coptic Catholic ecclesiastical province : the eparchies of Alexandria (Patriarch's original home see), Assiut, Guizeh (Gizah), Ismayliah, Luqsor (Luxor), Minya and Sohag. ^ Roberson, Ronald G. "The Eastern Catholic Churches 2010" (PDF). Eastern Catholic Churches Statistics. Catholic Near East Welfare Association. Retrieved 28 December 2011. ^ a b c d e f g h Roberson, Ronald G. "The Coptic Catholic Church". Eastern Catholic Churches. Catholic Near East Welfare Association. Retrieved 27 January 2012. ^ a b c Herbermann, Charles, ed. (1913). "Eastern Churches". Catholic Encyclopedia. New York: Robert Appleton Company. ^ a b "Patriarchal See of Alexandria". Catholic Dioceses in the World. GCatholic.org. Retrieved 27 January 2012. 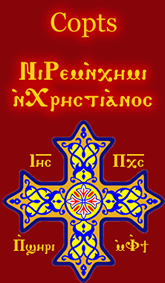 ^ "Pontifical Mission - The Coptic Catholic Church". www.cnewa.org. Retrieved 2017-01-20.